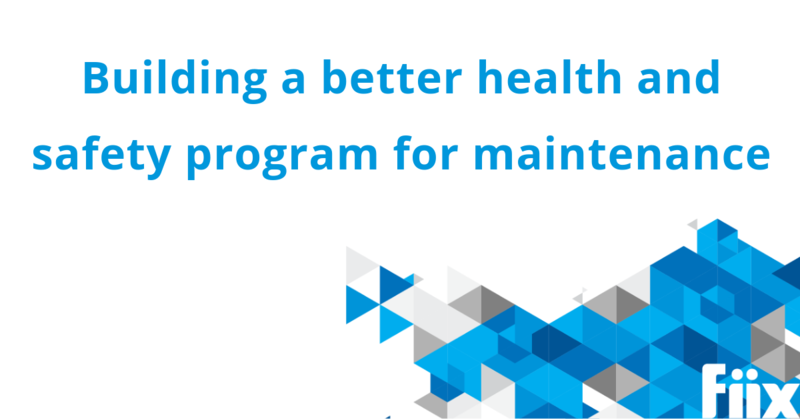 An in-depth look at the challenges maintenance managers face when building an effective health and safety program and what they can do to overcome these obstacles and succeed. Accidents in the workplace often deal double damage to everyone, especially in maintenance. Not only do they harm the individual, but they also prevent the rest of the team from doing their best work. This can lead to all sorts of consequences, from increased downtime to higher insurance costs. Because health and safety are so crucial to a company’s success, it’s important to learn how to improve health and safety at your manufacturing facility. According to one study, formal safety training is associated with a 24% reduction in injury rate. This means workers are spending fewer days away from work because of injury and are as healthy as possible while on the job. When everyone involved in maintenance understands how to be as safe as possible, you can increase asset reliability, cut costs and boost morale. Training is only the first step in improving health and safety at your operation. Staff must actually follow the procedures put in place for a successful health and safety program. Only then can a facility reap the rewards, guarantee compliance and avoid accidents. Creating an exceptional program for health and safety is easier said than done. There are several roadblocks when it comes to establishing a plan and following through. But with the right tools, systems and legwork, a great health and safety program can make a huge difference to the quality of life of your workers and the quality of the maintenance they provide. Here are some of the biggest obstacles that production-heavy facilities face when trying to improve their health and safety program. Timing is everything, as they say. Finding the best time to provide adequate health and safety training is a big challenge in the world of maintenance as it’s rare to experience a lull in work. There’s always an asset to repair, a machine to inspect or reports to create. If that wasn’t enough, safety guidelines, compliance procedures and other regulations can change fast and maintenance teams need to be trained quickly to meet standards. On the other side of that coin, a packed schedule can lead to rushed work and a failure to complete tasks in a safe way. When technicians don’t have time to follow procedure or find the proper guidelines, things can go bad. When a massive to-do list overwhelms a technician it can keep them from entering data properly or at all. Missing information can be the difference between success or failure on an audit. Not all assets are created equal. Some pieces of equipment require specialized skills or extra training to manage and repair. If your facility has a lot of these specialized assets, and several technicians to handle them, safety training can be equally diverse. The number of resources and training sessions increase with every instance of specialized instruction. Not only does training become difficult to coordinate, it also costs more and requires you to find instructors with the qualifications to provide the training. When executing a health and safety program, a need for specialized skills or knowledge can stretch your the maintenance team thin. If work piles up and a technician is assigned a task they aren’t qualified for, it can lead to an accident, or worse. Keeping track of these specialized skills and how they relate to certain assets can be very difficult and time-consuming. You can provide the best health and safety training in the world, but it will be meaningless if staff don’t take it seriously or are preoccupied. It’s not enough to put a checkmark next to everyone’s name for simply completing the session. The maintenance team must feel comfortable and engaged by the training. When they don’t, the information fails to register and accountability is nonexistent. When a facility fails to obtain buy-in from staff, safety tasks aren’t executed as they should be. Technicians do not feel a responsibility to follow procedure or stay up to date with the latest health and safety information. This results in a dangerous work environment on two levels. First, technicians fail to follow guidelines and are injured. And second, a task isn’t done properly and creates a hazardous situation for future work. When everyone involved in maintenance understands how to be as safe as possible, you can increase asset reliability, cut costs and boost morale. One of the most difficult parts of improving your health and safety plan is keeping track of who has adequate training. This information determines how you build a training program that addresses the maintenance team’s gaps and reinforces their strengths. It’s important to know the status of every employee and their certifications, skills and past training. This is particularly difficult when using pen and paper or Excel, as accurate information is harder to collect and organize. Having an inadequate method for tracking health and safety qualifications can lead a maintenance manager to unknowingly assigning a dangerous task to an unqualified technician. You must have a system that enables you to frequently and easily track employee skills. If not, the information will be out of date and therefore faulty, leading to a dangerous situation. Standardization in maintenance is not often a priority. If a job gets done, the way it gets done is often secondary. Although this saves time in the short-term, it can lead to more work in the long-term and an increase in accidents. That’s because health and safety training is challenging in this environment. When there are no standard procedures in place, it’s difficult to properly instruct staff. A lack of standardization also makes it hard for workers to remember instructions and use them in the field. People generally forget up to 90% of the information they’ve been given within a week. A technician may recall that there is a specific way to do a task, but they probably won’t remember what it is without standardization. When this happens, tasks are done incorrectly and the likelihood of an accident increases. The following are five ways that maintenance teams can improve the health and safety program at their production-heavy facility. User profiles provide maximum visibility of the existing skills, training, and certifications of your team. This enables managers to track the skills that need to be acquired at both the employee and asset level. That way, training and skill deficiencies (certification and the need for recertification) can be flagged and tracked and a training program can be built to address them. User profiles also allow managers to input individual employee safety records. They contain all essential information about an employee and outline everything from the individual’s work history to their schedule. These details are key as they allow for the creation of a facility-wide health and safety record that can be used to comply with regulations and legislation, like the Occupational Safety and Health Act. An exceptional reporting process allows you to sift through health and safety-related information, target areas for improvement and create training programs from the results. For example, you may want to know which asset has the highest number of near misses and accidents. Developing a reporting system that provides this kind of data also allows you to conduct health and safety training that addresses these high-risk assets. Having a solid reporting process also helps keep staff safe on the job. If you want to know which technician has spent the most time working on a high-risk asset, an automated report can deliver this information to you in a minute. You can then establish roles for your maintenance team. Familiarity with an asset’s SOPs and potential hazards can reduce the likelihood of something going wrong. Formal safety training is associated with a 24% reduction in injury rate. This means workers are spending fewer days away from work because of injury and are as healthy as possible while on the job. Maintenance managers need to find the best time to provide training with the least impact on the flow of daily work. This requires a firm grasp on your schedule and how it affects production, backlog, labour, revenue and more. It’s also important to see where your operation is being stretched by the lack of specialized safety qualifications, so you can build health and safety training to address this issue. Clearly indicating priorities for work orders and scheduled maintenance is crucial when establishing a health and safety program. You must clearly indicate any health and safety concerns associated with work orders, tasks or assets so technicians are aware before starting a job. It’s also important to flag assets according to safety priority codes, allowing you to quickly and efficiently allocate work. A lack of standardization makes it difficult for managers to conduct health and safety training and for technicians to execute what they’ve learned. Building a digital knowledge hub can help solve this challenge. Create or collect checklists, naming conventions, diagrams and other resources and make them accessible to the team. This establishes and strengthens standard processes. Managers can easily teach these standards in a training session. Attaching instructional videos to an asset’s profile is one way to refresh a technician’s memory about safety procedures. SOPs, safety checklists and material safety data sheets (MSDS) are other resources that allow employees to enter data, ensure safety procedures are respected and create a record of compliance. A cloud-based, mobile maintenance solution can help technicians access these resources in an instant. Total productive maintenance breeds an environment of accountability and team buy-in by increasing visibility into how every role at a facility impacts maintenance efficiency. When this culture is created and reinforced, the commitment to a health and safety program from everyone involved, from maintenance managers to technicians, is strengthened and becomes a cornerstone of a successful maintenance program. Training is well-attended, staff are engaged and certifications are renewed without delay. Safety procedures are followed to the letter, potential risks are flagged immediately and data is input quickly and accurately. In short, health and safety become everyone’s top priority.